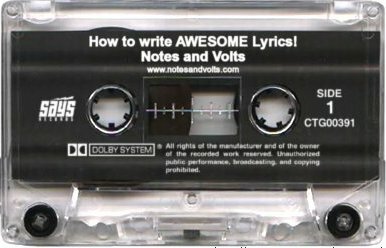 Notes and Volts: How to write AWESOME Lyrics! Top 10 tricks! How to write AWESOME Lyrics! Top 10 tricks! Kicking off the Month of April with a Masterpiece!! 2 - Street, Beat, Heat: You can build an entire career with this rhyming gold! Apparently the Street has a Beat that causes you to feel the Heat. Perhaps you should move your Feet? Move your feet to the beat on the street. Feel the heat of the street beat....This stuff writes itself! From the works of Toni Basil..
4 - Hearts: Don't use the word "Love" in your song. Replace it with the word "Heart". And always, Always, pronounce it with a weird pseudo British accent so it sounds like "Haaaht". A Heart is a good thing to search for when you're fightin' in the night in the citaay. The great Don Johnson used this to great effect. 6 - Huntin' Animals: When it comes to love, every man is a Hunter. And his prey? Fine lookin' Ladies! That's why Leopard print spandex was invented. Ladies love being treated like a wounded Gazelle. Use this to your advantage! The great Don Dokken knew what time it was when he wrote..
7 - Cry, Goodbye: Sometimes you may need to write a sad song. You only need to know these simple phrases. When we part you break my Heart. I will Cry when you say Goodbye. And I'm your lady, baby. There you go! Everything you need to know to become a master song writer! To show you how it's done, I touched my diamond encrusted song-writing quill to paper and the following gold spilled forth...Watch and learn! You're Welcome! If you think you can do better, write your "masterpiece" in the comments below..
WOW. That was amazing. Really! But you know something? YOU FORGOT TO ADD BABY-LADY! Thanks for the comment! As for Baby-Lady...Check out rule #9. Respect! It's this empty garbage which is ruining modern music. How about writing lyrics which actually convey meaning and emotion; Something you have experienced or actually know about. Stop encouraging this kind of imbecilic song writing- Please!